Scarlett Stevens answers the phone as if she already knows you. San Cisco are, by now, one of the most popular indie-pop bands in the country, but they’re still very much that – indie. There are no labels or publicists listening in as Stevens sits down between a photo shoot and band practice. Scarlett Stevens is San Cisco’s drummer and, since they formed in 2009, has also taken “a lead in the image realm” for San Cisco’s dreamy, disco look. Stevens offers a glimpse into that disco-ball-glitz – a European summer, replete with Parisian apartments, Italian beaches and dope APC clothes. 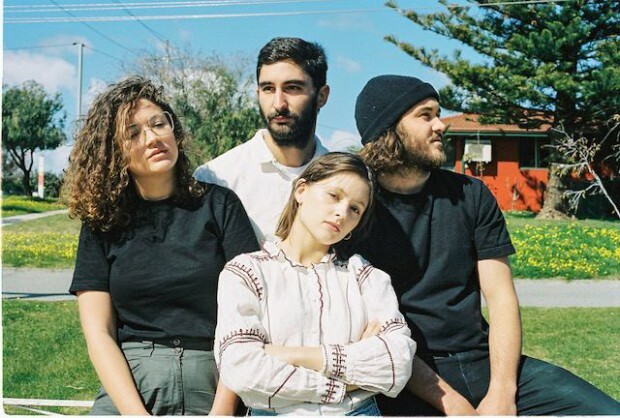 It’s all a much needed break before San Cisco join fellow Aussie indie-darlings Ball Park Music on a country-wide tour September through October. And what have her band-mates been up to before they hit the road again? “Jenny (Aslett) has been tour managing Stellar Donnelly, so she was actually overseas as well.” Not to mention juggling another full-time gig, admin for the Instagram account @DogsEatingGently. It’s on the note of personal histories that Stevens believes lies lead Davieson’s biggest song writing strength. So could we see an Aussie ‘Watch the Throne’ after this tour with Ball Park Music? Perhaps then San Cisco’s cover of Daft Punk and Rodgers “Get Lucky” was a message for the man, the myth. If you’re reading this Rodgers, give em’ a chance. Stevens remains tight-lipped about any new covers though and says as little as possible for now about a potential future solo project, DJ Beryl Streep. One thing is for certain; she’ll keep building the hype. Smoke machines, laser beams and all. Catch San Cisco and Ball Park Music around the country this September and October. When & Where: City Oval, Ballarat – Saturday October 20.